Father. Exercise Physiologist. Athlete. “Diaper Guy.” These are just a few ways one can describe Jason Fitzgerald, our November Vermonter of the Month. In 2007, Jason was out for an early morning run when he started thinking about different ways to help Vermonters, and it hit him: diapers! According to the National Diaper Bank Network, 1 in 3 American families experience “Diaper Need” and lacks access to a sufficient supply of diapers. As a father, Jason understands the financial burden that purchasing diapers can put on a family, especially given the lack of public funding available specifically for purchasing diapers. With the help of his employer, Dee Physical Therapy (Dee PT), Jason created the Great Diaper Drive, which collects diapers for families assisted by the Committee on Temporary Shelter (COTS). 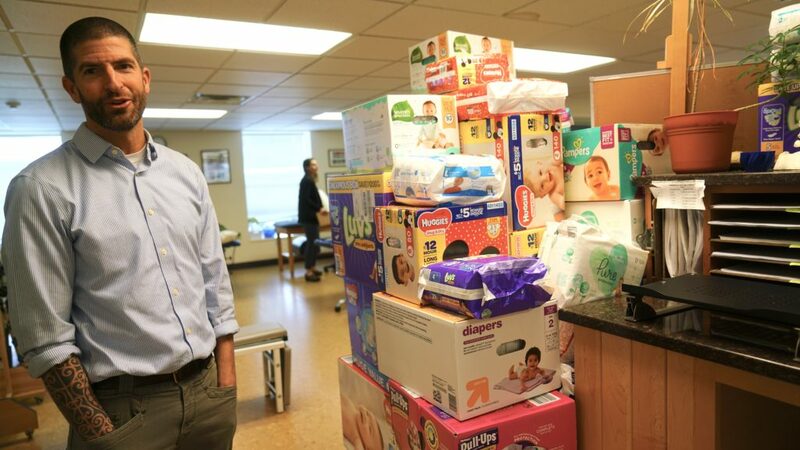 Through sheer force of will, the drive, under Jason’s leadership, has collected more than 325,000 diapers over the past 11 years for Vermont families in need. What inspires your work, both at Dee Physical Therapy and in the community? My work at Dee Physical Therapy is inspired by my coworkers. They put so much into the job and care so much about the wellness of other people. I’m one of those people who enjoys coming to work every morning. I’m so fortunate to be able to come to work and know that I’m helping people get stronger and reach their goals. My work in the community is inspired by my kids. I am lucky that I was put in a situation with Dee Physical Therapy that I was able to work at a place that allowed me to start a fundraiser. I want my kids to see that when you are put in these situations you should find ways to reach outside of the four walls you work in and try to help people every day. Why diapers? How did you come up with the idea of the drive? I start each day with an early morning run. I use this time to think and come up with different ideas. Some of these ideas seem amazing at the time, but when reflecting on them the next day, they often seem ridiculous. In 2007, I had two children both in diapers—Riley (now aged 14) and Kaia (12). I was out for my daily run when I thought about diapers—how expensive they are and how, as a parent, you are constantly worried about running out of them. I wondered if there were any organizations or fundraisers that collected diapers and I couldn’t think of any. When I went to work that day, I mentioned it to my coworkers who thought it seemed like a good idea. I then reached out to the Committee on Temporary Shelter (COTS) to see if they would be interested in a fundraiser that collected diapers. COTS said that there was a need for families living in their shelters and seeking services from their organization, but that no one was collecting diapers at the time. What has been the impact of the Dee PT Great Diaper Drive and what does it mean to you? When the drive started in 2007, 6,000 diapers were donated and sustained a couple of COTS’ families. Now, as the drive has grown, we are able to collect enough diapers to last for an entire year for all of the families COTS serves. The impact of the drive is more than just diapers; it allows families to save money that would otherwise be spent on diapers for independent housing. We did the math and a box of 100 diapers can cost about $35. Depending on how many kids you have, what ages they are, and what’s going on with their bodies, a family can go through 10-12 diapers a day. Since the drive began 11 years ago, we’ve collected over 325,000 diapers. As a parent, there is nothing worse than knowing that you don’t have a diaper for your child. The diaper drive has taken away some of this burden that parents are dealing with on a day-to-day basis and is allowing them to save for housing. This drive means a lot to me. I’m fortunate to be the one that gets to talk about the drive and spread awareness, but it really is the community around me that supports this effort. Through the drive, I’ve been able to make connections with amazing people. There are people that come back each year to donate diapers that they’ve been saving up all year. It’s a true community effort. What’s your goal for this year’s diaper drive and where can people donate? What advice do you have for other businesses (or individuals) looking to impact their community? Look around you. See what resources you have and take advantage of them. I’m not a fundraising guy and it’s a lot of hard work, but I’m so glad I did it. Every year I think about how to make the drive more efficient and effective. Ask for help. Vermonters want to help each other, including people they don’t know. This is a huge asset and a great part of living here. This entry was posted in Business, Consumer, Vermonter of the Month and tagged #VermonterOfTheMonth by ldunn2. Bookmark the permalink.